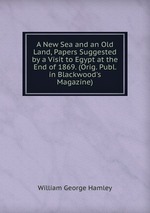 Аннотация к книге "A New Sea and an Old Land, Papers Suggested by a Visit to Egypt at the End of 1869. (Orig. Publ. in Blackwood`s Magazine)"